Today’s electronic locks meet your need for monitoring time schedules, audit trails, and knowledge of who has entered or exited your property. Our selection of access control systems can be customized to provide multiple access codes as well as dedicated time zones. Once wired to your network, these controls compile data reports for review / archive. 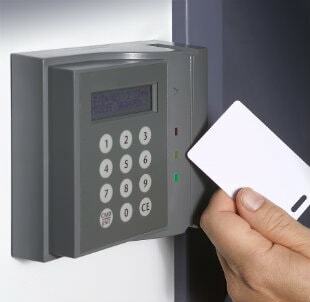 How can my business benefit from a keyless access control system? Time-Controlled Access – All devices can be programmed by time-of-day, day-of-week,“per entry” and “per employee” basis. Audit-Trail Reporting – Know who goes where and at what time – all the time! Time & Attendance Reporting – Paperless time cards with break and lunch verification. Alarm Notification – Produce email alerts and phone/camera system responses to entry breaches. Dual Authentication – Require 2 access methods for entry to sensitive areas. Anti-Pass Back – If someone does not enter legally, the same person is unable to exit. No Tailgating!